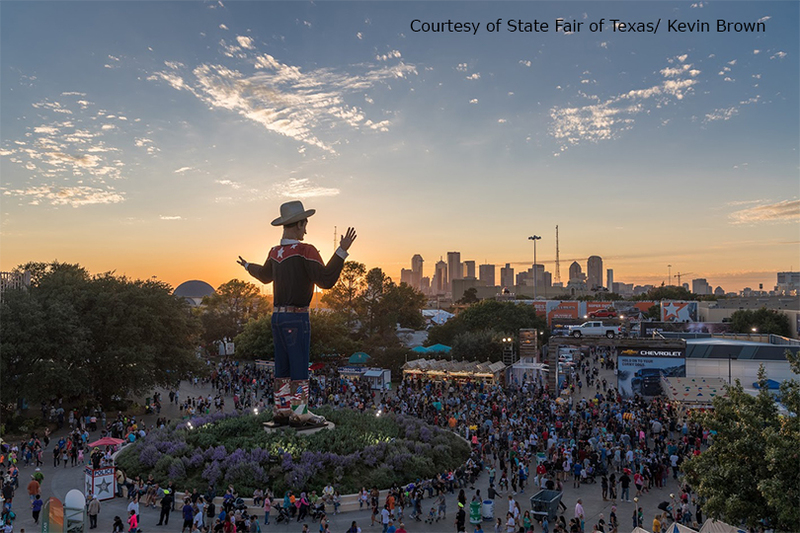 Whether you go for the fried foods, midway or livestock shows, one thing is for sure—the State Fair of Texas is back! And this year, there’s more than 270 acres of activities for the whole family. Families can experience the excitement of harvest at Texas Farm Bureau’s Harvest Experience. The interactive exhibit is in TFB’s Planet Agriculture area inside the former Food and Fiber Pavilion, now called the Go Texan Pavilion. The fair also includes a Kids’ Boardwalk with free activities for children, livestock in the barn, a petting zoo and educational activities like Little Hands on the Farm, a milking parlor with demonstrations and Big Tex’s Farmyard. “New this year, one of our biggest exhibits, in The Hall of State is going to be Texas in the First World War, as well as America in World War I. It recognizes the 100th anniversary of America’s entry into World War I,” Condoianis said. “This pays tribute to a respected cartoonist, John Knott, whose artwork was more than 15,000 pieces throughout his 52 year history of working for The Dallas Morning News. A lot of those drawings are going to be on display in The Hall of State, and people can walk through and see those,” Condoianis said. Big Tex’s Urban Farm, which was introduced in 2016, will also be open so guests can see how the new crops and hydroponic system are doing. The farm started with 100 planters and has grown to 520 in the off-season. “We’ve been able to donate a significant amount of produce in this community,” Condoianis said. New food offerings this year include the Funnel Cake Bacon Queso Burger and the Gulf Coast Fish Bowl, which is filled with blue tropical punch, Swedish Fish candy, Nerds candy and a pineapple ring. The Briscoe Carpenter Livestock Center also opens this year. It’s the first building to be built in Fair Park since 1993. Agriculture Awareness Day is set for Tuesday, Oct. 10. This year’s fair theme is Celebrating Texans. Proceeds from the fair help preserve and improve Fair Park, underwrite museum, community and scholarship programs for inner city youth and students pursuing agricultural careers and helps improve state fair operations. Tickets are on sale now on the fair grounds and at BigTex.com. To hear more about the State Fair of Texas on the TFB Radio Network click here.